2. Advertisements by external advertisers (non-members) on the webpage will appear on the Blog page in the side panel on the right. When a visitor to the page clicks on these block advertisements, it will take him/her to the full advertisement on the Marketplace page. The full advertisement can be linked to the advertiser’s website or Facebook page/group. The cost hereof will be R250, payable into the National Council bank account, and will remain in these two places on the webpage for four weeks. 3. Wing Riders SA will not design advertisements for external advertisers on Facebook. These advertisements need to be submitted on Facebook directly by the advertiser and will only be posted after approval by the administrator. 4. If an external advertiser has no advertisement readily available, Wing Riders SA will design advertisements for the website, on request, at the cost of R250. All advertisements need to be approved by both the advertiser and Wing Riders SA. 5. Both external advertisers and members may advertise second-hand and personal items (excluding bikes, trikes and trailers) for free on both Facebook and the website. Business owners (in line with their business) pay as per the above for website advertisements. These need to be approved by the administrator. 6. 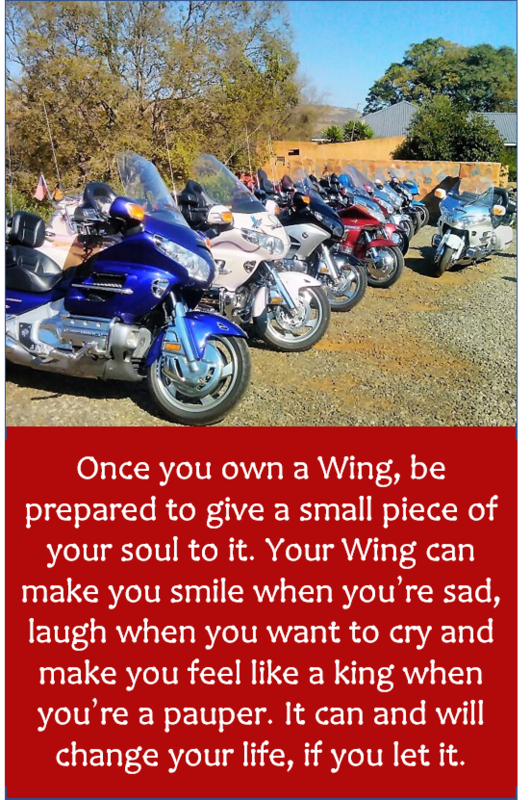 Members of Wing Riders SA advertising bikes, trikes and trailers on the website of Wing Riders SA, as well as external advertisers (non-members), will be requested to pay a donation of at least R500 per advertisement. The advertisement will remain on the website and on Facebook until the bike, trike or trailer is sold. Once sold, the advertiser must immediately inform the Marketing Co-ordinator to the effect and arrange for payment into the account of Wing Riders SA. 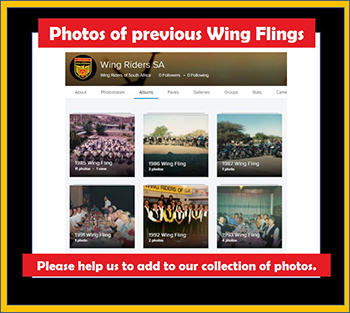 Should the advertiser sell the bike, trike or trailer while the cause of the sale was not due to Wing Riders SA’s website or Facebook group, the advertiser/seller may be obliged to declare the purchaser’s full particulars and contact details. 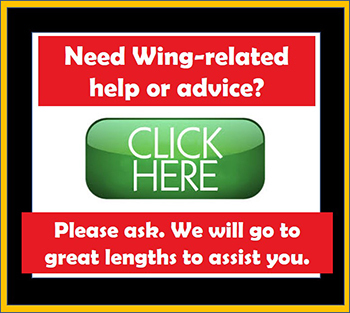 Important: The Marketing Co-ordinator will, as a rule, request this information from sellers as the Association are always looking to involve new owners of Gold Wings with the Association’s chapter activities. 7. 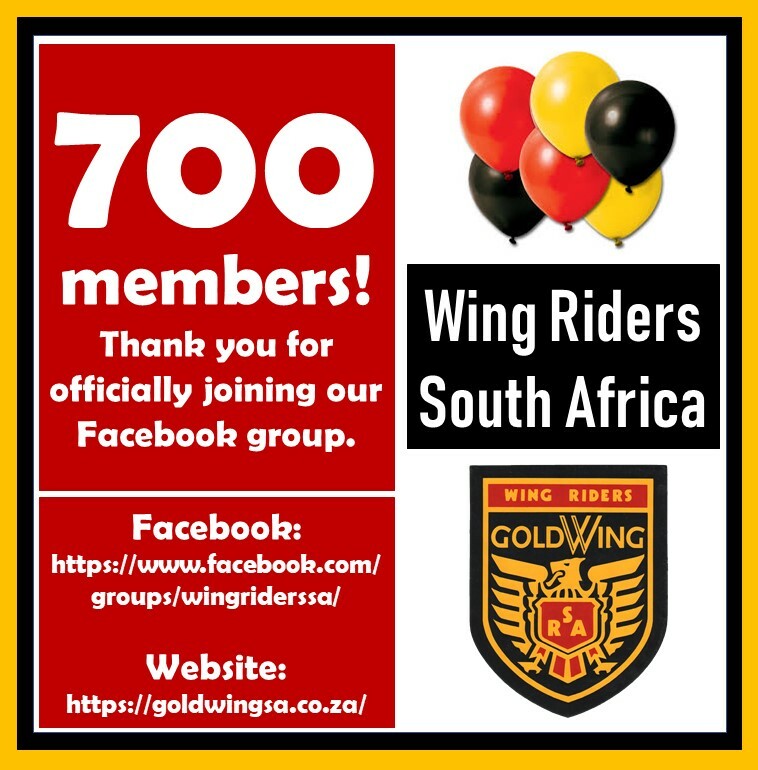 Wing Riders SA wishes to continue doing business in the spirit of integrity and honour as the Association is known for being ethical and professional at all times.